Back in November I shared our activities from hosting a 2 and 3-year-olds play group. Some moms in my neighborhood and I take turns each week hosting our little group which consists of 4 little girls who are now all 3 years old. Contrary to what you may think, this is a super fun and easy thing to host. These kids get along so well and are so well behaved. Of course, it helps that activities are planned for the whole amount of time. If only a birthday party could go this smoothly. I am just getting around to hosting it again in my home. 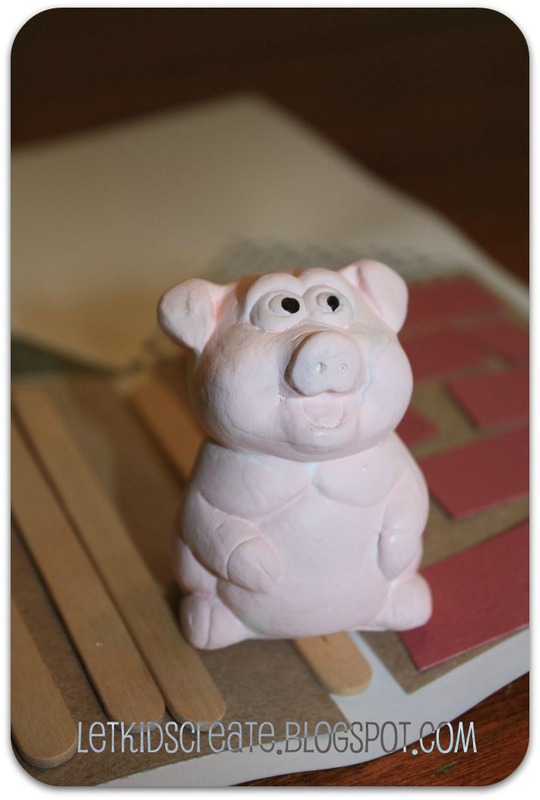 This time I decided on a 3 Little Pigs theme and set up the activities and crafts accordingly. As the kids arrived, they came in and began to play with the Little People village I had set up. This was a huge hit, I think they could have played with just these toys the entire time. After the kids had all arrived, I was able to coax them over to the table (really, they just wanted to play with the Little People). I had found these little plaster pigs on clearance at Michael's for only 19 cents a piece. The kids had a great time painting these. 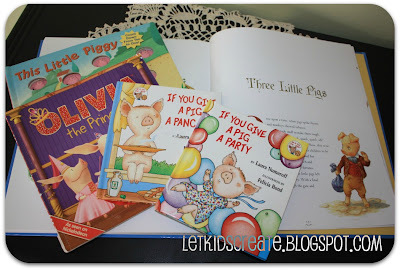 While we were letting the pigs dry, we sat down and read some pig books: The Three Little Pigs, Olivia the Princess, This Little Piggy, If You Give a Pig a Pancake, and If You Give a Pig a Party. I am truly amazed at how these kids can sit through this many books. Well, there were a few who were still playing with the toys. By now, we were running out of time. We barely had time to get started on these Little Pigs houses and parents were arriving to pick up their kids. I also had a game planned that we entirely didn't get around to. I opted to do the craft instead of the game because I had prepared all this stuff and didn't want it to go to waste. The kids got to glue straws, sticks and bricks to the three houses. 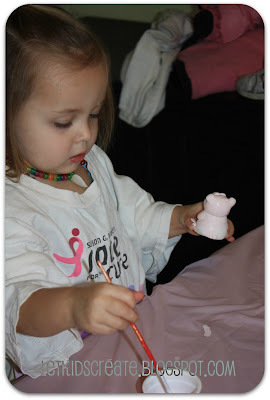 I think that any craft involving glue is a hit with kids. The first house pictured here is just a shot of how I had envisioned the craft to turn out- just to give you an idea of what it was "supposed" to look like. The middle shot is one my 7 year-old put together the night before when I was prepping. She used shredded paper for the straw house, but I opted to use drinking straws the next day purely for the purpose of having less of a mess. The third set of houses pictured is the one my 3 year-old put together and pretty accurately resembles how the other kids put their houses together as well. My girls and I ended up playing the game later in the afternoon. . . stay tuned. We had a lot of fun! 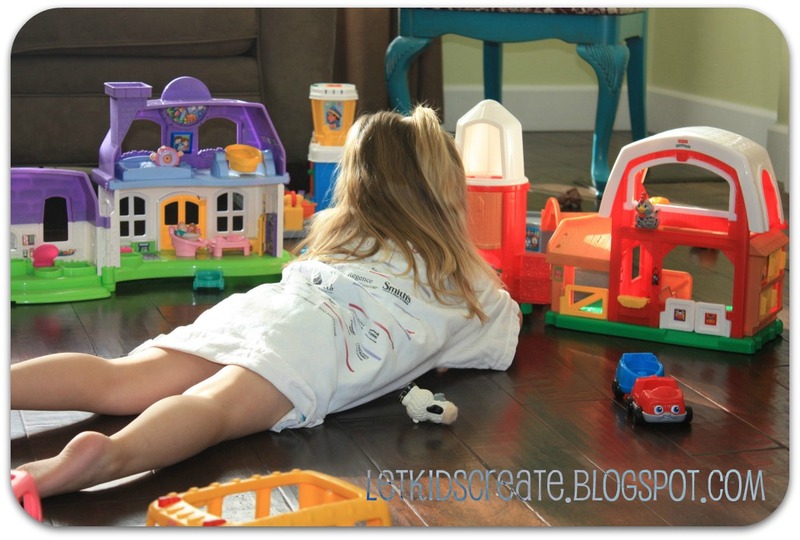 Linking to NurtureStore Play Academy. 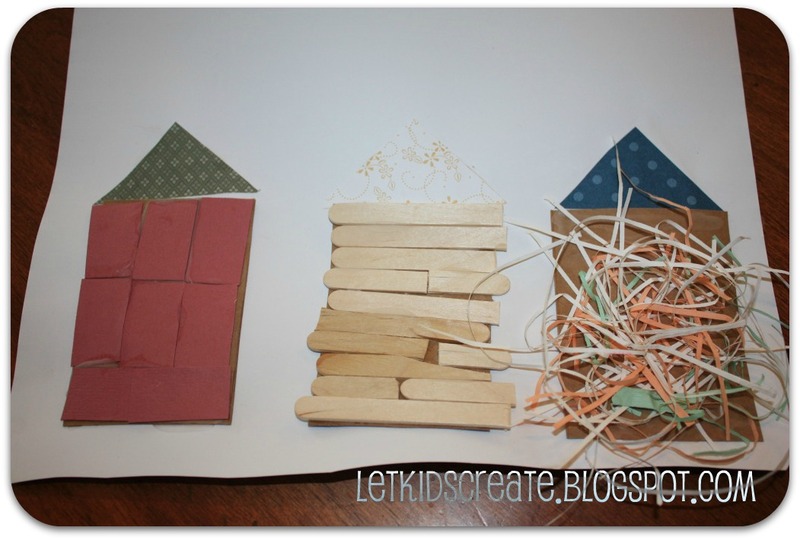 Love this post great activities! This is one of my son's favorite stories. He would love these activities! I should try a theme day based around his favorite books occasionally. Thanks for the idea! LOVE LOVE LOVE this idea! My daycare kiddos are obsessed with the song The 3 little Pigs by Mr. Eric and this would be a GREA activity to go along with it!! thanks for the idea!!!! I also adore this idea! I am going to do this one in co-op, thank you so much! It finally snowed- let's play!